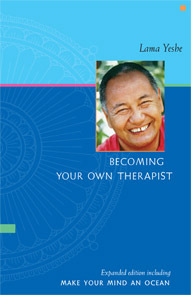 This expanded edition contains both of the very popular Lama Yeshe booklets, Becoming Your Own Therapist and Make Your Mind an Ocean. The talks in this booklet are on the general topic of the mind. Two were lunchtime lectures at Melbourne and Latrobe Universities. One was an evening lecture given to the general public. Perhaps of greatest interest is the lecture entitled "A Buddhist Approach to Mental Illness." Lama presented this talk to a group of psychiatrists at Prince Henry's Hospital who were delighted to meet and question Lama, and this historic exchange underscores the difference between Western and Buddhist concepts of mental health. Order a print copy by clicking the Add to Cart button on this page, or visit your favorite ebook vendor using the links below. You can also find Becoming Your Own Therapist and Make Your Mind an Ocean online, where you can read the book, download a PDF, listen to original audio files and access links to translations. LYWA Members can download the ebook for free from the Members Area.